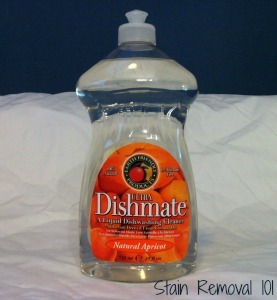 I recently tried the Earth Friendly Products Dishmate soap in the apricot scent, and wanted to share with you what I thought of it. I was shopping in Marsh, which is not my normal grocery store, when I saw this product on the shelf and knew I wanted to try it, since I'm on a quest to find a good eco-friendly dish soap. The first thing I noticed when I used this product was the pleasant scent. I love fruity scented things, and while the scent was unusual it was bright and made me feel cheerful too, which is a nice little pick me up when you're washing dishes by hand. The soap was a bit thin for my taste, which meant I had to be careful not to squeeze too much out onto my sponge, so I didn't use more than I needed. That was especially true with this brand, which is called "ultra" meaning it should be more concentrated. It cleaned my dishes pretty well, including greasy pots and pans which is always a big test for any dish soap I try. Overall, I was quite happy with this brand and would definitely buy it again if I see it in stores. That's one of the issues I have with it -- I don't normally see the product in stores I frequent. In the future I think I would like to try another of the scents offered, since they've got some that sound like they would smell good, like grapefruit and pear, plus they also have an almond scented version which I'm not so sure about but I'd probably give it a try. Finally, for those of you who don't like any scent they do have a scent free version as well. I'd love to hear from even more people who've used this dishwashing soap, sharing how it has worked for you. You can share your dishwashing liquid review here for this brand, or any other you've used, telling me what you like, or don't, about it and why. You can also read lots of reviews for brands that have already been submitted (and if you're only wanting to compare natural dish soaps click here).